In case Lady Luck hasn't been smiling at you of late, then you should definitely give Double Ya Luck slot machine a go and try to change your fortunes. The old style slot game may be played at three reels and as many paylines, but it hides numerous exciting surprises in store, progressive jackpot included, and has the potential to award amazing prizes. One would not normally expect what looks like a simple three-reel slot to have too many special features attached to it, but this is exactly what makes Double Ya Luck stand head and shoulders above the competition. The game contains an impressive Wild symbol and no less than three Scatters, while numerous bonus rounds award free games, multipliers, instant credit prizes and more. Casino chips with 'Double', 'Ya' and 'Luck' engraved on them represent three of the four special symbols, with red dice completing the list. When it comes to non-feature icons, these resemble the ones found in Vegas-style fruit machines, with the likes of bells, horseshoes, dollar signs, cherries, diamonds, one bar, two bar, three bar and lucky sevens populating the reels. Try and get three lucky sevens on a payline to land the progressive jackpot. Select one, two or three paylines and choose coin value from $0.10 to $1 before pressing Spin or Autoplay to start the game. Double symbol acts as Wild, not only replacing all other non-feature icons, but also multiplying each payout by x2. Ya, Luck and Red Dice icons are the three Scatters and these are used to unlock numerous special features. The first two of these only appear on reels 2 and 3 respectively. Get Double, Ya and Luck icons anywhere on reels 1, 2 and 3 simultaneously and you will unlock the Gamble Feature, winning up to 40 free games at x4 multiplier. Obtain three Red Dice Scatters left to right to activate the Boardgame Feature. Each dice will then roll to reveal a number and the token will move on the board displayed around the reels to reveal your prize. Hit three Double Wild symbols on an active payline and you will receive the game's top payout of 1,000 credits or up to $1,000. There are two ways to win the progressive jackpot while playing Double Ya Luck. 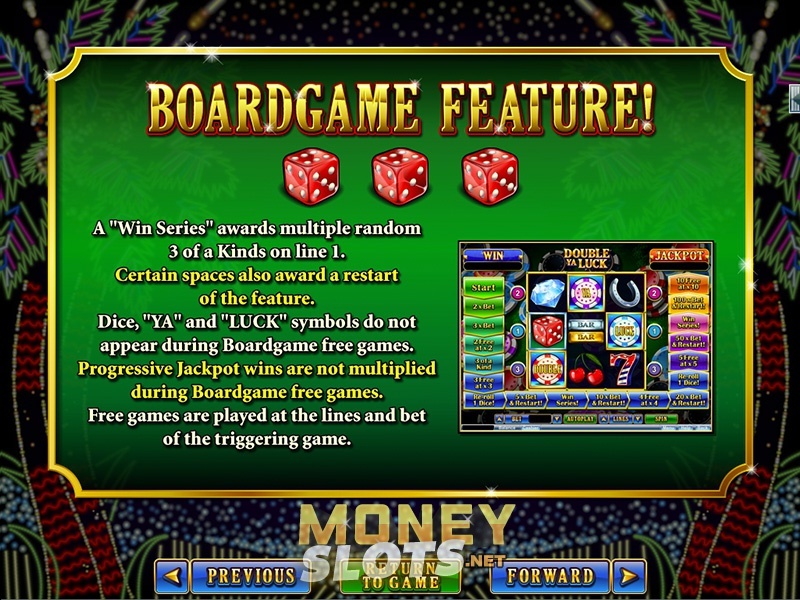 The easiest way is to get three lucky seven symbols on an active payline, while you can also land the top prize by activating the Boardgame Feature. Three Red Dice Scatters are required to unlock said bonus and you can in turn be awarded the progressive jackpot.